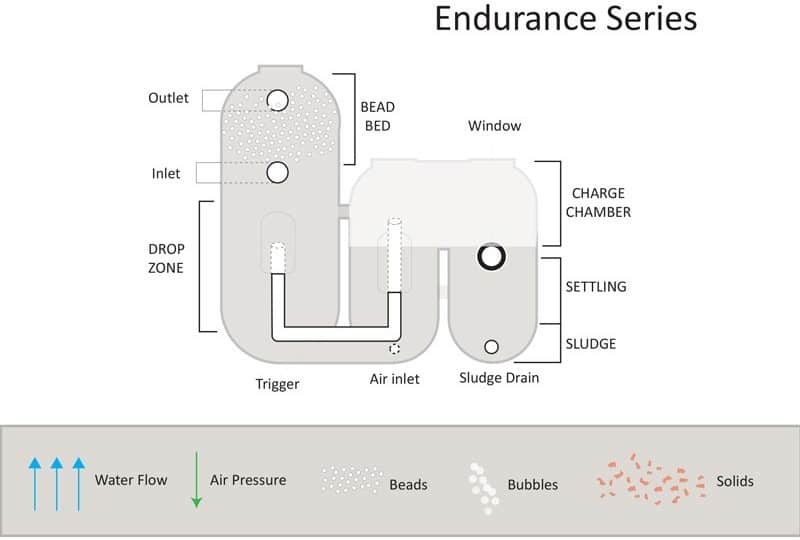 Endurance Polygeyser Bead filter – an advancement of our patented PolyGeyser® technology with the addition of many new enhancements and increased performance features. These exceptional filters backwash automatically, several times a day. The user does not need to turn off the pump or close any valves during the backwash sequence. The filter does not require an electric timer. 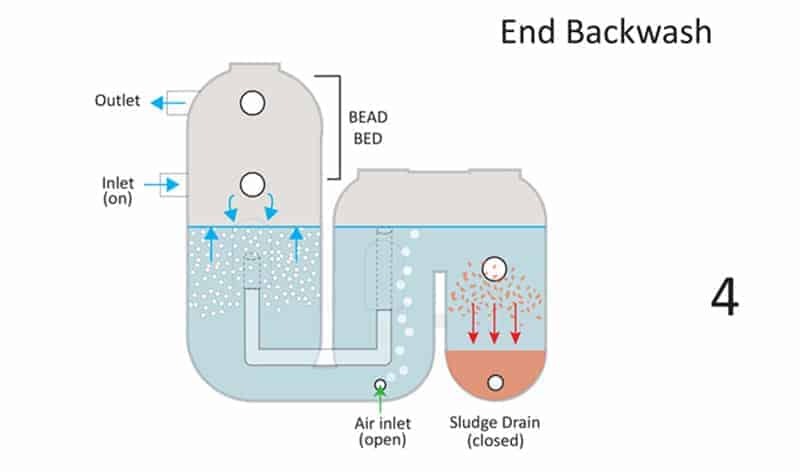 The backwash cycle is regulated by the air that is injected into the charge chamber. The filters clean and recycle the dirty water produced in backwashing every two to three hours. Sludge is only removed once or twice a week. The water moves from the inlet up through the bead bed. 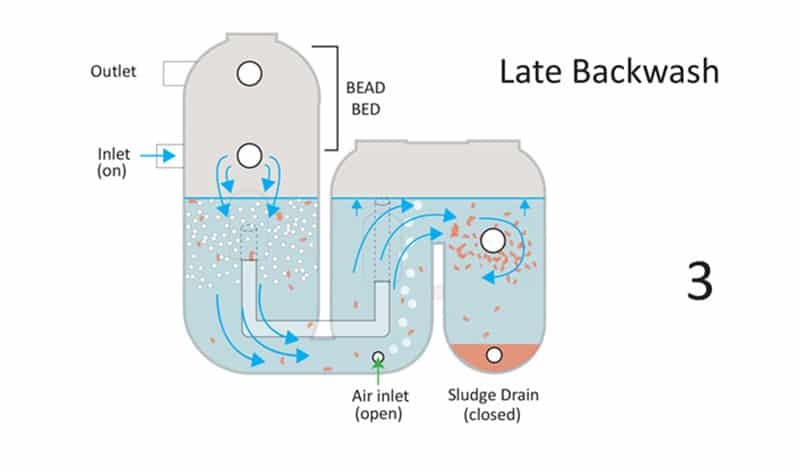 The bead bed provides surface area for the water purifying bacteria and captures solids within the aquatic system. Air is slowly injected into the charge chamber, gathering in the top of the filter. As more air enters, this places downward pressure on the water level. The water level drops trapping water in the settling zone, and solids from the last backwash settle into the sludge basin. The rate of air injection controls the length of time between backwashing events. Air has made its way through the trigger into the bead bed. The bubbles agitate the beads; knocking solids and biofilm off the beads. As the air pressure in the charge chamber drops, the dirty water from beneath the bead bed sweeps through the chute carrying the solids into the adjacent compartment. 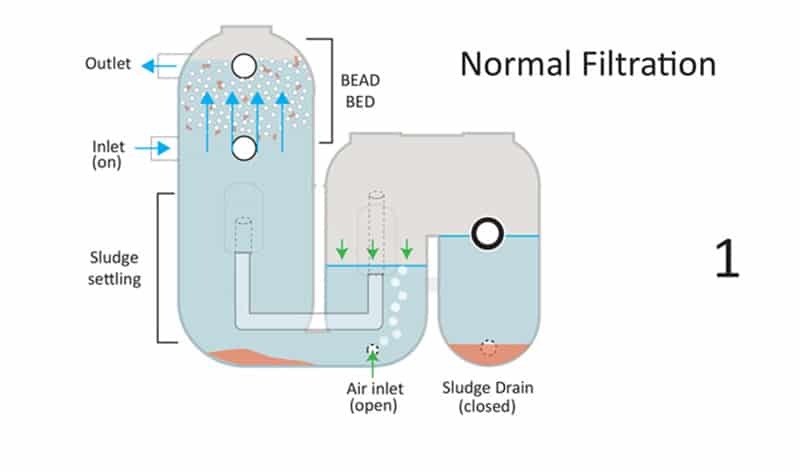 No water flows out of the filter during the short 3 – 5 second backwash event; instead the dirty backwash water is captured in the charge chamber and the sludge basin. The beads float in the drop zone where they continue to be scrubbed by the escaping bubbles. 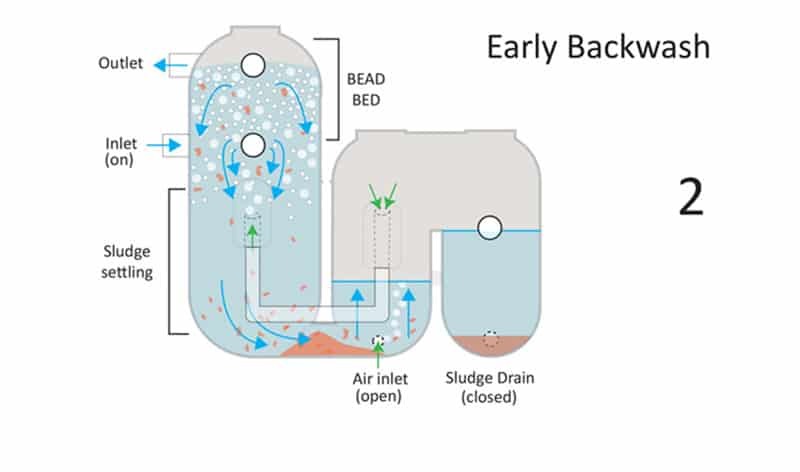 Water flows downward through the mixing bead bed and more solids are washed from the beds to settle towards the bottom. 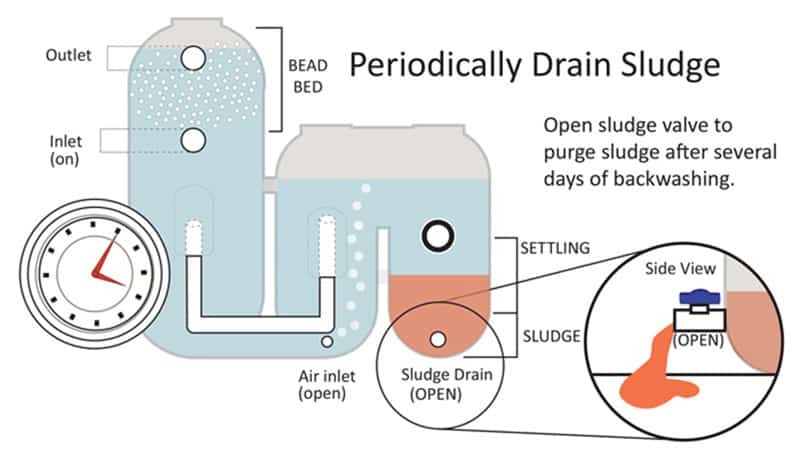 The downward flowing water sweeps into the middle compartment, flushing the solids that have accumulated on the bottom of filter and depositing them into the sludge basin. The water level rises in the shorter chambers. Eventually the water rising in the sludge chamber floods the trigger, bringing water movement in the charge chamber and sludge basin to an end. Trapped solids begin to settle as the filtration chamber is refilled with the water from the inlet. The beads float back in place to reform the bead bed. As soon as the water rises to the outlet, filtration resumes. At the end of the backwash, the beads rise back to the top of the filter. Most settled solids have been swept to the sludge chamber. The filter will continue to filter and backwash itself several times a day. After the sludge has built up, the user can open the sludge valve to drain the concentrated sludge from the filter. The filter backwashing frequency is usually set for a few hours, so the filters will backwash several times a day. Sludge accumulates in the sludge basin. Every few days, perhaps once a week, the sludge drain must be opened to let the sludge out. A natural fertilizer, the sludge can be poured out on the lawn or nearby plant where it will naturally degrade.